Based on the book of the same name by Kevin Kwan the movie Crazy Rich Asians showcases some of the must-see spots of Singapore. The film, a romantic comedy drama follows the discovery by a Chinese-American professor that the man she has fallen in love with is, unbeknown to her, the richest and most eligible bachelor in Singapore. The movie has been generally well received and if you haven’t seen it I would recommend it even if just to give you some inspiration to visit the beautiful island state of Singapore. And to be honest the main character played by Malaysian actor Henry Golding is rather nice too! Crazy Rich Asians was shot on location in Singapore and Malaysia and features so many of the most iconic places to see and experiences you can have when visiting. So check out these must visit Singapore film locations seen in Crazy Rich Asians! 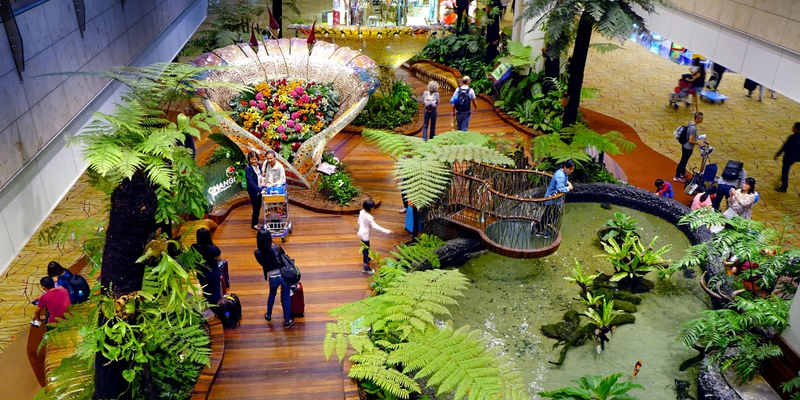 Consistently voted the best airport in the world Changi is more than just an airport! With numerous gardens including a butterfly garden, sunflower garden, cactus garden, and crystal garden to relax in as well as movie theatres, a rooftop swimming pool, numerous dining options and shopping experiences Changi could almost be a holiday destination in its own right!! If you are simply in transit through Singapore and have 5 1/2 hours to spare there are even two free tours you can choose to take from Changi. You can find out more about the Heritage Tour or the City Sights Tour on Changi Airport’s official website. This is one Singapore film location which may look slightly different from that shown in Crazy Rich Asians. Undergoing refurbishment until 2019 Raffles Hotel must be the most iconic of Singapore’s establishments and filming was completed before the refurbishment began. 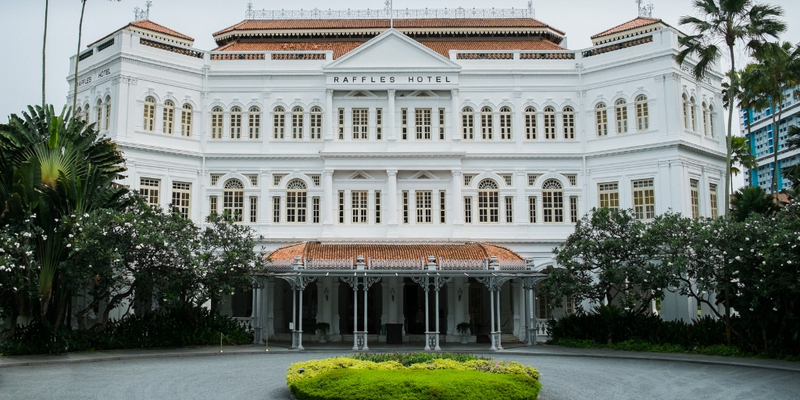 Raffles was opened in 1887 and has had some of the most famous guests stay there over the years. It really is an iconic hotel and an absolute must visit. Even if you can’t afford to stay for a night or two it is possible to have a rather lovely afternoon tea there or a Singapore Sling or two in the famous bar. The official mascot of Singapore is the merlion. 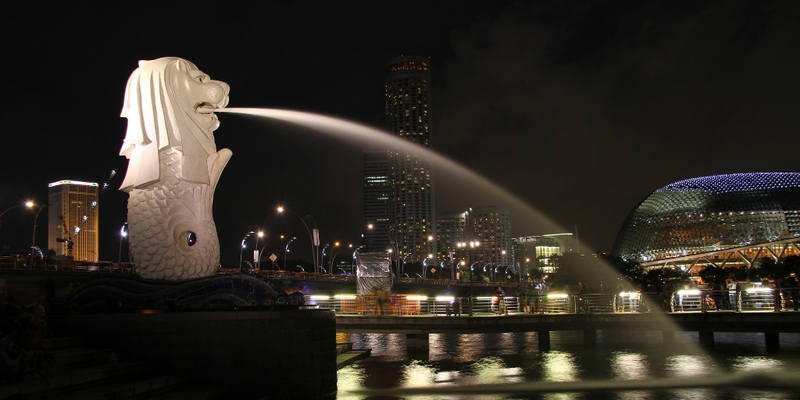 The merlion is a mythical creature with the body of a fish and the head of a lion. While there are 5 official Merlion statutes in Singapore the one seen in the film is the original. It stands at 8.6 metres tall and can be located at Merlion Park at One Fullerton. Look out for the smaller Merlion cub that can also be found in the park. You can’t visit Singapore without spending some time in a hawker centre. For some of the best in Asian cuisine these are the places to go. I love hawker centres not only for the food but for the atmosphere too. Manic, crazy, busy but with delicious aromas that will have your mouth watering. The most difficult thing is choosing what to have! The food is good, the prices are cheap so try lots of the dishes! Highly recommended local dishes include chicken rice and chilli crab! Yummmmm!!! 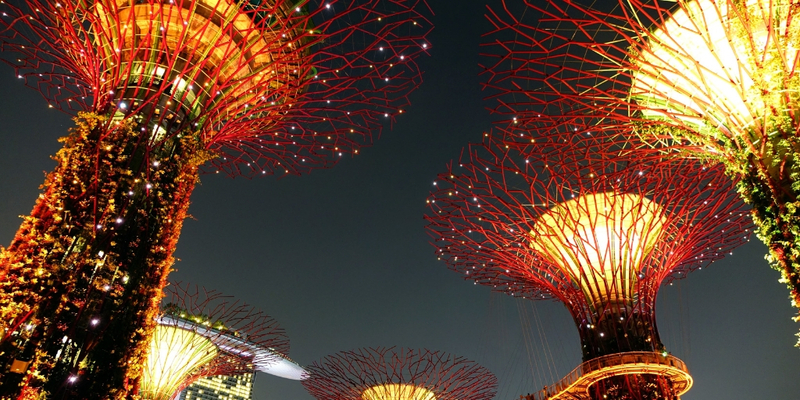 My favourite Singapore film location seen in Crazy Rich Asians is Gardens by the Bay or more specifically Supertree Grove. Twelve of the eighteen Supertrees found at Gardens by the Bay are in the grove. 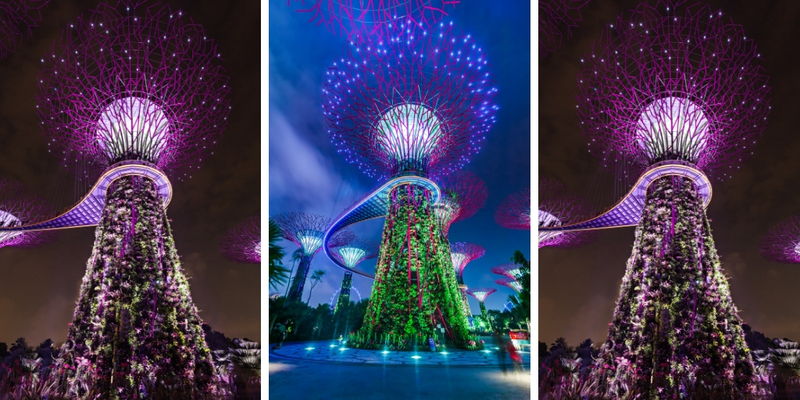 These beautiful Supertrees stand between 25 and 50 metres tall and are a truly spectacular sight to behold in the evening when they come alive during a music and light show in the evenings. According to the official website there are over 162,900 plants comprising of more than 200 species and varieties of bromeliads, orchids, ferns and tropical flowering climbers planted on the Supertrees. Whatever you do make sure you do not miss the nightly Garden Rhapsody light and sound show. Its a jaw dropper! 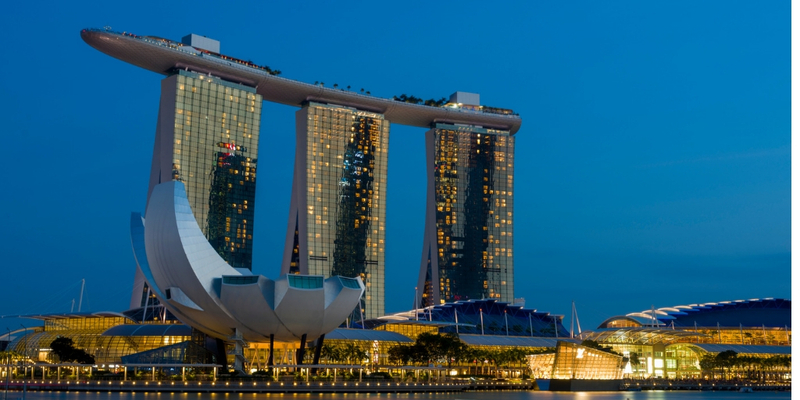 Surely THE most iconic and instantly recognisable landmark in Singapore the luxury hotel Marina Bay Sands with the highest and largest infinity pool in the world is a bucket-list experience for many. A night in this, one of the world’s top hotels, may set you back a few dollars but from those in the know is worth every single cent. 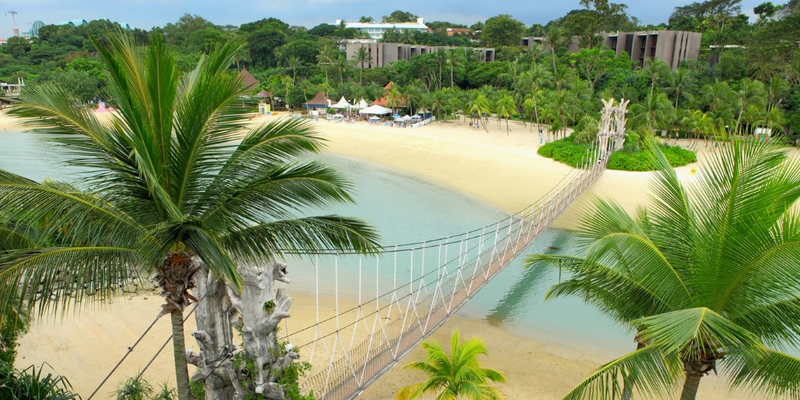 Sentosa Island is an island resort off Singapore’s southern coast. 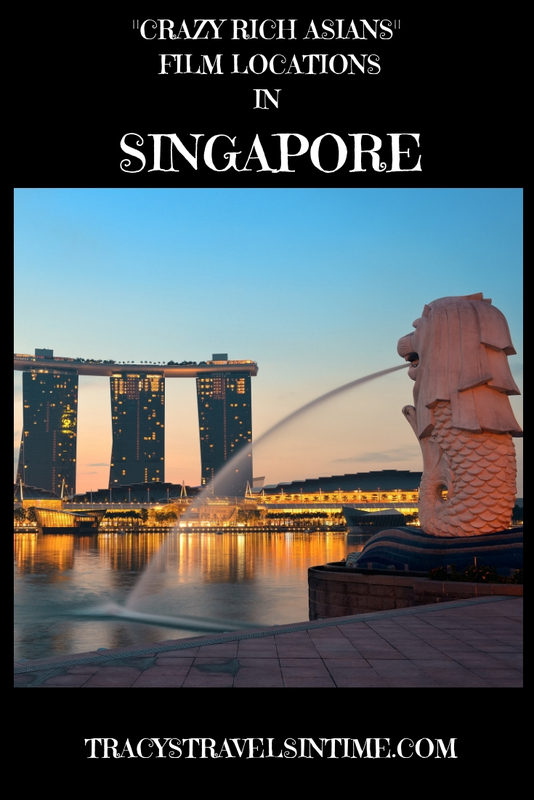 A popular tourist destination it can be reached easily from Singapore and has beaches, theme parks, museums, an aquarium and its very own merlion. Get there by road, pedestrian walkway, monorail or my own favourite – cable car. Now I swear I saw bumboats* in the movie and if I did then they surely originated at Clarke Quay. 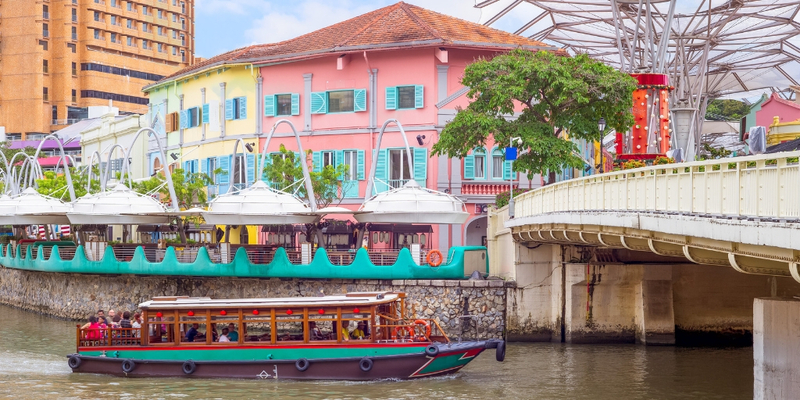 This is our favourite place to stay in Singapore as this historical riverside quay is in my view perfectly located to get the best out of any visit. The quay itself has great bars and restaurants and is the boarding point for river cruises on the aforementioned bumboats! *In Singapore a bumboat is a small boat or water taxi that is used for quick transport and river tours. There is a lot of shopping in the movie and if you are shopping in Singapore there is only one place to go and that is to Orchard Road! 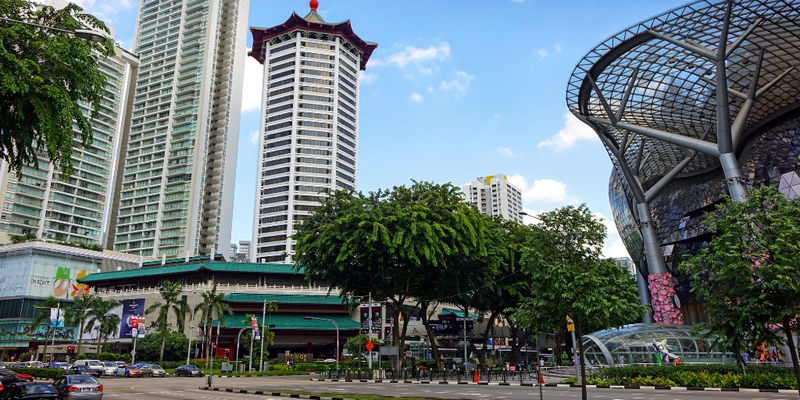 Probably the most famous shopping street in Asia Orchard Road with its numerous Michelin starred restaurants, luxury hotels and top-end retail stores has it all! Although maybe not strictly one of the Singapore film locations used during Crazy Rich Asians this is definitely be the place to buy your designer outfits! 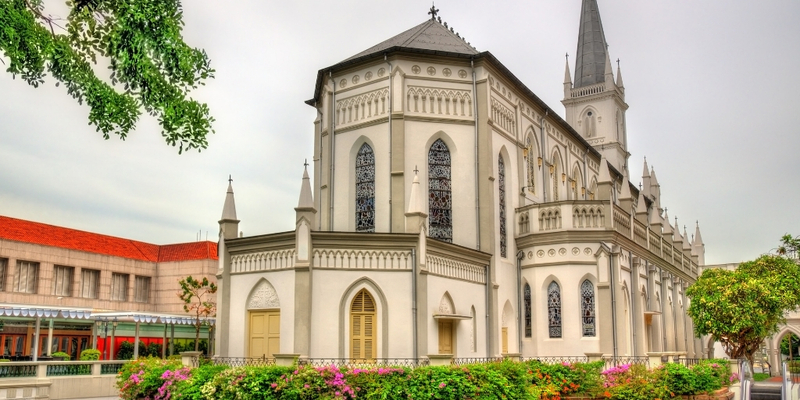 The setting for the wedding in the movie (giving nothing away here) is Chijmes which is a beautiful heritage building originally built in 1852 as a Catholic convent. The structure is now home to restaurants, bars and events. Chijmes is located at 30 Victoria Street in Singapore. 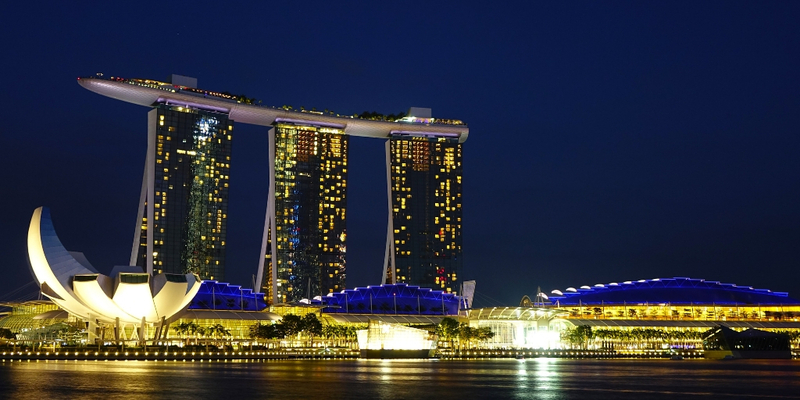 Accommodation in Singapore is not cheap so expect to budget rather a lot for your stay! So why not blow the budget and stay in some of the world’s most iconic hotels. Who does not want to stay in this hotel and swim in that infinity pool? I know I do and it remains on my bucket list! So go on treat yourselves and book a few nights and let me know what you think!! To make memories that will last a lifetime book your stay HERE! I think I would have a few nights at the Marina Bay but then I think a transfer to Raffles would be a must! Closed until 2019 book early to see what all those renovations have done! My third choice is another famous Singapore Hotel and I would be very happy to stay at The Fullerton Bay Hotel. Floor to ceiling windows in the bedrooms has me sold! Official currency is the Singapore dollar. You can get around Singapore by metered taxi but this can be an expensive option(especially if this is your only way to get around). I recommend using the MRT (subway system) as it is clean, cheap and safe. Buy a Singapore Tourist Pass which will allow you unlimited travel for one day (S$10), two days (S$16) or three days (S$20). Although credit cards are accepted just about everywhere I would still recommend carrying some cash with you. It is hot in Singapore. And humid. Very humid. All year round. It can however be freezing in shopping centres due to the air conditioning. The haze. Sumatran forest fires cause smog which can smother Singapore. If you are there during this time don’t expect to enjoy those famous views of Marina Bay Sands. 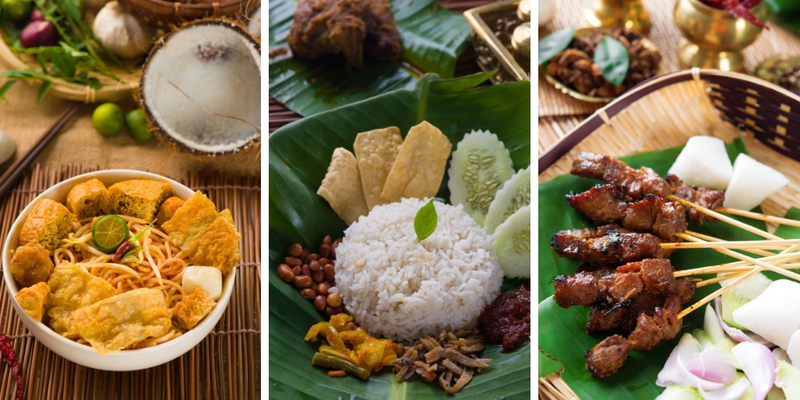 Eat in a hawker centre – please please please don’t just eat in your hotel. Wow, had no idea there were so many iconic places to see in Singapore! Great post! It really is a fab place to visit! Haven’t seen the movie yet, but looks like it presents Singapore in its glory. Thanks for sharing an excellent guide through Singapore. I haven’t read the book or seen the movie, but I’ve heard the movie is really good! It’s great that they used so many actual places in Singapore! I’ll have to keep an eye out for all these places if I ever see the movie! Oh I miss Singapore! I used to go a lot for work and it is such a fun place to spend a few days. We used to stay opposite Raffles and go to the bar there. My boss once told me that he knew the band and I said – yeah right!! But of course he did and was up on stage with them playing saxophone for a few numbers. Ah well!! Luckily he thought it was funny. I haven’t seen Crazy Rich Asians but I think I need to now. Sounds like a laugh. Sounds amazing Katy! I would definitely like to spend more time there! Those lit up supertrees caught my eye — beautiful! I’ve heard this movie is so good. How fun to see these locations where it was filmed. It was great spotting them when we watched the film!